Pavedrive driveway paving offers a practical and versatile concrete block solution for homeowners looking for a new driveway. Available in seven colours: Charcoal, Buff, Grey, Burnt Ochre, Forest Blend, Red and Brindle and two thicknesses: 50mm for standard domestic use and 60mm for more heavy domestic use. 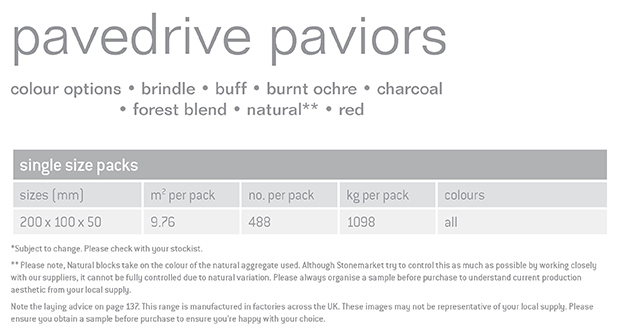 Available in 7 colours: Charcoal, Buff, Grey, Burnt Ochre, Forest Blend, Red and Brindle. Two thicknesses available: 50mm and 60mm.